Roadmunk lets you share roadmaps in different ways depending on who you're sharing with. Do you want someone on your team to collaborate on a roadmap with you? Or, do you need your manager or someone in the executive leadership to review the roadmap and provide feedback? If you want someone on your team to collaborate on a roadmap and be able to add and edit items and create views, add them to your roadmap as an Editor. TIP: See Who can you add as a roadmap Editor? and What can a roadmap editor do? below. You can add as many Editors as you want to a roadmap, and you can remove an Editor or change their permissions at any time (see Change a roadmap's sharing settings). Users are notified via email whenever they're added to a roadmap as an Editor unless they've turned notifications off. TIP: You can also give users view-only access to a roadmap by adding them as Viewers. You add an Editor to a roadmap using the Sharing Settings dialog. You can open the dialog from your Roadmap Home or directly from the roadmap. 2. In the My Roadmaps panel, select the roadmap you want to share. On the dialog's Users with Access list, you'll see yourself listed as the Owner of the roadmap. If you've already shared the roadmap with other users, you'll see them on the list as well, together with their Permissions to the roadmap (Edit for Editor and View Only for Viewers). 1. If the person you want to add as an Editor is not already on the list, click in the Invite Users field and select their name. You can also start typing the name. 2. 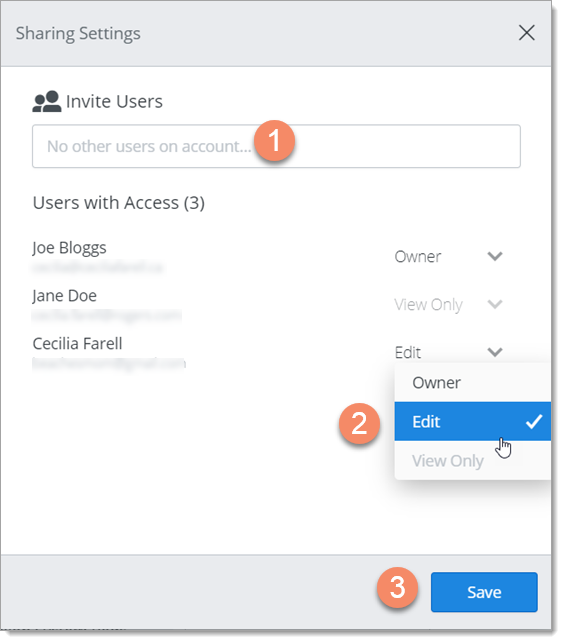 In the Users with Access list, click the user's Permissions dropdown and select Editor. TIP: If Edit is grayed-out and you can't select it, it means the person's user role doesn't allow them Editor access to roadmaps. The Users with Access list should now show the person added as an Editor. Who can share a roadmap? To share a roadmap, you must be the Owner. Whoever creates a roadmap automatically becomes the Owner. You can see and access all the roadmaps you own in the Roadmap Home My Roadmaps panel. Who can you add as a roadmap Editor? You can only add users with a Collaborator role to a roadmap as an Editor. You can give users with a Reviewer role view-only access to a roadmap by adding them as a Viewer. What can a roadmap Editor do?